This 'tembe' or 'kere' is woven in two sections, which are joined together and seamed to form a tube. The section of the sarong that is worn at the front is woven in a banded pattern in shades of red and decorated in an elaborate design with stylised motifs of birds, deer, ships, figures and trees in a supplementary weft metallic weave. The back of the garment is less elaborate with a green plaid pattern decorated with a design of eight-petalled flowers in metallic thread. 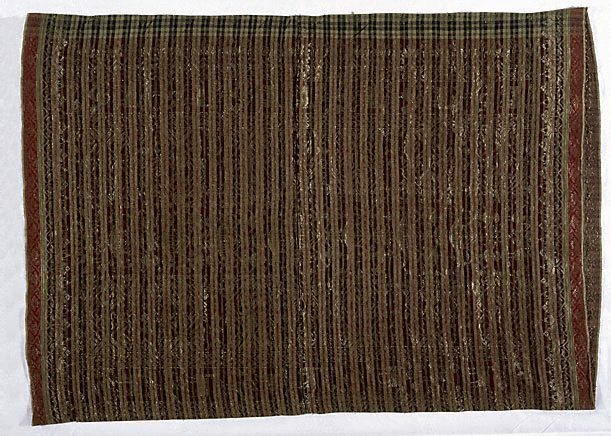 As this textile is in very good condition and of high quality, it is probable that it once belonged to a sultan or a member of the aristocracy.